AzhwAr was asked “you make fun of sivan as being body to emperumAn and hence he cannot preach others about emperumAn. You are also emperumAn’s SEshabhUthar (servitor) only. How then would you be able to know about emperumAn and preach his qualities to others?”; he responds saying “whenever his sathva guNa (pure good quality) surfaces, sivan learns about emperumAn; but when rajO and thamO guNas surface, he thinks of himself and proclaims that he is Isvaran (one who controls sentient and insentient entities). That is not the case with me. Since emperumAn showed himself to me, there is no question of forgetting him at any point of time”. maRappanO – how can I forget? onRum maRandhaRiyEn – AzhwAr says that there is nothing of emperumAn’s qualities that he does not know. OdhanIr vaNNanai – How can I forget him? Is his [beautiful] form such that it could be forgotten! Isn’t his form like that of an ocean which removes one’s sorrow instantaneously on seeing it! inRu maRappanO – He came and displayed his beautiful form to me. Is there any possibility for me forgetting him? EzhaigAL – Oh people, who are poor because of lack of knowledge on emperumAn! Do not think that I too have matters in this world to think of just as you people have and forget emperumAn? anRu karuvarangaththuL kidandhu kai thozhudhEn kaNdEn – when I was in the womb, he came and showed himself to me [since poygai AzhwAr was born in a lotus flower, the lotus flower itself is considered as the womb]. emperumAn showed himself there because “when he is in the womb, he will not reject me if I show myself to him now. Hence this is the correct time”. 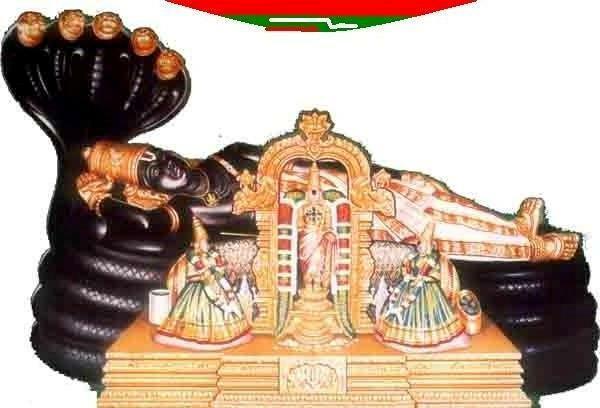 nammAzhwAr says in thiruvAimozhi 2-3-3 “aRiyAk kAlaththuLLE adimaukkaN anbu seyviththu” (emperumAn showered his mercy during the time that I was inside the womb, when I had no knowledge). mahAbhAratham SAnthi parvam 358-73 says “jAyamAnam hi purusham yam paSyEth madhusUdhana: sAthvikas sa thu vigyEya: sa vai mOkshArtha chinthaka:” (only that person who is blessed by madhusUdhanan [emperumAn who killed the demon madhu] at the time of his birth, has sAthvika (purely good) qualities; he will desire the purushArtham (goal) of mOksham (SrIvaikuNtam)). Thus, having remembered emperumAn at a time when I could not have thought of (viz. inside the womb), will I forget now when I can only think of him! kaNdu kai thozhudhEn – I was able to see. As a result of seeing him, I joined my hands in salutation to him. thiruvangam mEyAn thisai – he came on his own towards me and gave me knowledge. I did not forget his nature, his form, his qualities and his wealth. Is it the parathva state (the supreme state of emperumAn that he displays in paramapadham [SrIvaikuNtam]) of emperumAn that AzhwAr is talking about? No, it is in the archA state (the form displayed by emperumAn in various dhivya dhESams) which is the epitome of his simplicity. It is his form in SrIrangam that I will never forget [emperumAn is reclining in SrIrangam because no one rejected him when he came here]. We shall consider the 7th pAsuram next. This entry was posted in iyaRpA, mudhal thiruvandhAdhi on June 14, 2017 by T N Krishnan.